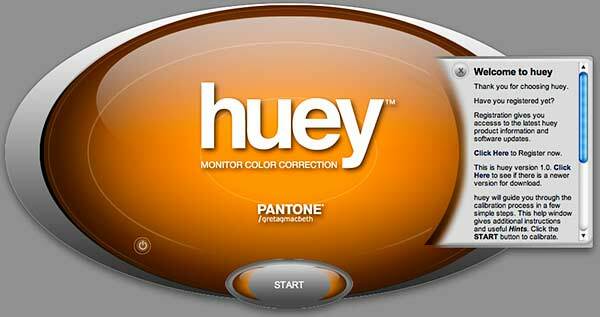 The Huey, from Pantone/gretagmacbeth sets a low cost entry point for monitor profiling and calibration software. Keith has been looking at this unique device (it is a colorimeter) and the approach it takes towards offering colour management and improving colour on your display. 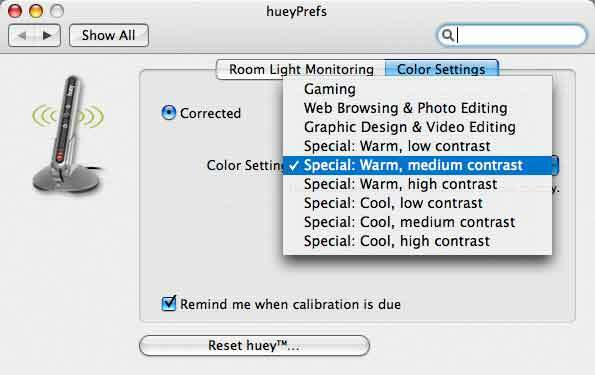 2013 – Because of the huey’s age, we suggest looking at the Spyder 4 express or ColorMunki Smile for basic monitor calibration. The Mac version of the Pantone Huey is reviewed here, but the Windows version works in the same way. 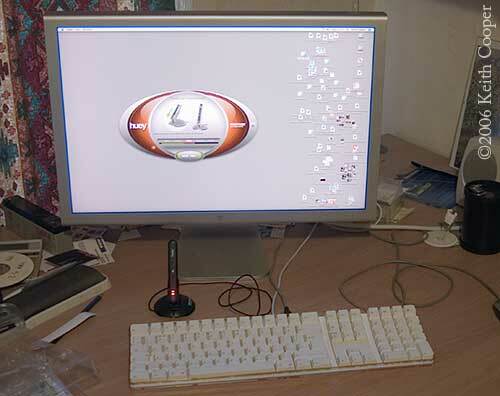 Support for Mac universal with Intel-based Apple computers. Simplified Chinese language support. 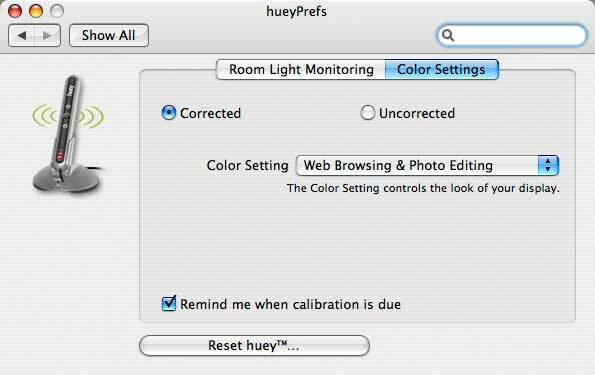 Improved calibration on Windows 2000 platform, the profile created will now be selected as the default monitor profile after calibrating with huey. Enhanced Metadata stored within the profile, providing descriptive information regarding the custom profile. How do you know that a particular colour red on your monitor is correct? If you send me a picture, then how do I know I’m seeing what you did? If you are completely new to colour management you might also want to look at the very short ‘What is Colour Management’ article I’ve written. 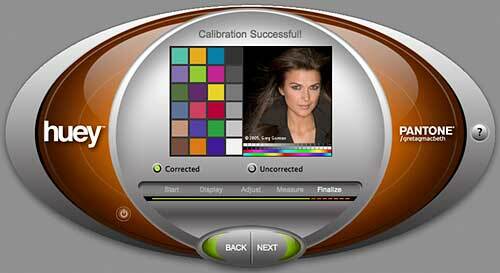 There is really only one place to start with Colour Management – your monitor. If it doesn’t display accurate colour, it’s difficult to get your prints right and even less likely someone else will. Before calibrating your monitor on Windows PC systems, you should check to see that Adobe gamma is turned off if it was installed. 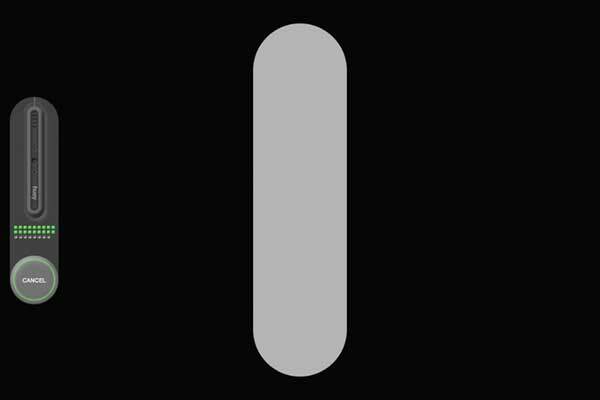 We’ve got a short guide to removing Adobe Gamma that might be of help.At it’s simplest you should adjust your monitor by eye to get good brightness and contrast. There are various software tools that can help you in this (see the Viewing Page in the Articles/Resources section) but these are at best a partial solution (they rely on your eyesight for one thing). You need a hardware device of some sort that will make the adjustments for you. 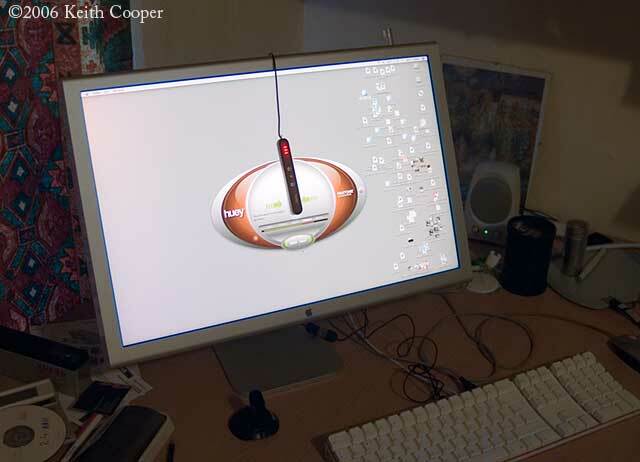 The software that comes with the device builds ‘icc monitor profiles’ which are used by your operating system (MacOS or Windows for example) or software (such as Photoshop) to produce an accurate display. There is one last aspect that is important — standards. There is no point in me having my monitor set up to some arbitrary setting, if there is no way of you knowing what my setting means. This comes about from there being no one ‘correct’ way of setting a monitor. I’ll come back to this later when I’ve shown how the Huey profiling colorimenter and software works. Will the huey make my monitor match my prints? I’ve been asked this a couple of time and have written a short article on how it will help, but why you need to consider some other factors as well. 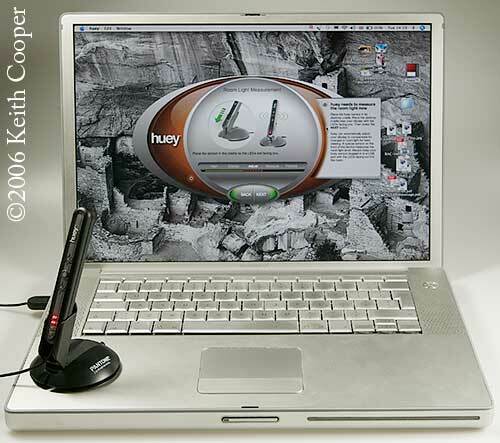 The Huey is a small 10cm long device that comes with a stand, USB extension lead, software CD and pack of screen cleaner. 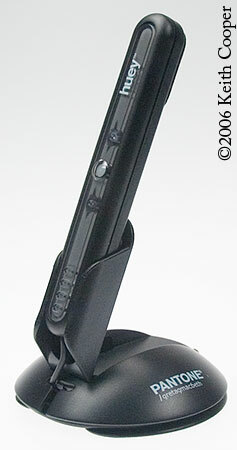 The picture shows the device at almost life size. 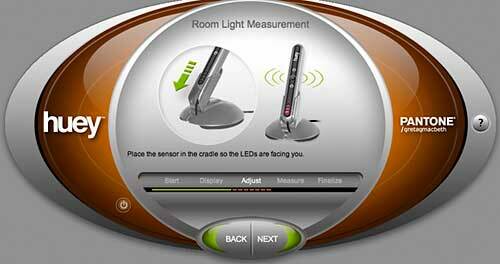 The sensor clips into the stand, and is used in this configuration to detect changes in room lighting. One feature not mentioned in the (brief) literature supplied with the device, is that the base can hold the cable and USB plug underneath. The grey patch half way along the back of the device is the ambient light sensor. 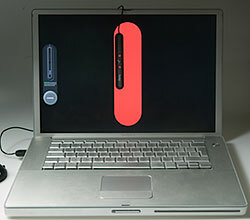 The four patches at the bottom are LEDs that light up when the device is being used. Also, take care with that very thin USB cable, it wouldn’t take too much of a tug to break it. The underside of the Huey, showing (left) the suction caps that hold it to a screen when being used, and (right) the 3 sensors used in making the screen measurements. … and on my desktop machine. Next you are asked to attach the sensor to your screen. It says that it’s OK to stick to LCDs, but obviously I didn’t attach it too well. The sensor falls off my screen. You can see the blur of the red LEDs on the back of the sensor as it plummets to its doom (pure luck this photo!). That’s it … I’m not sticking things to my rather expensive LCD screen! I’d suggest that if you have an LCD you use gravity to assist. I cannot recommend trying to stick anything to an LCD. Tilting the monitor back allows the Huey to rest in place. Note also the similarity in organisation between my computer desktop and actual office desktop. 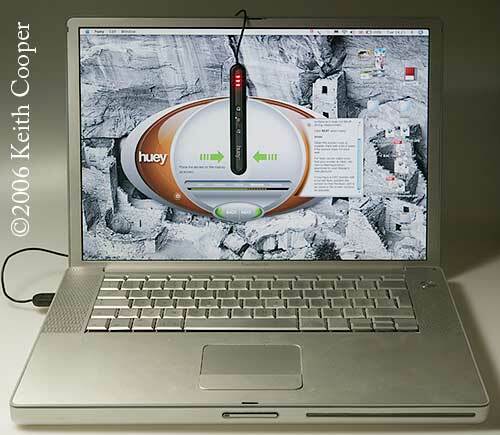 Similarly, here is the Huey being used on my PowerBook. The screen shot below, shows one of the coloured patches that the device reads (grey in this case). The green dots display the progress of the calibration process. When the 26 green dots are lit up, the process is complete. Afterwards you can replace the sensor in its cradle. You can see just how much the calibration process has changed things by switching between corrected and uncorrected modes. 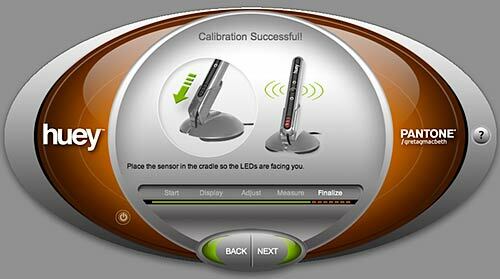 Select a calibration setting that you want to use. I’ll explain what these actually mean in a bit. 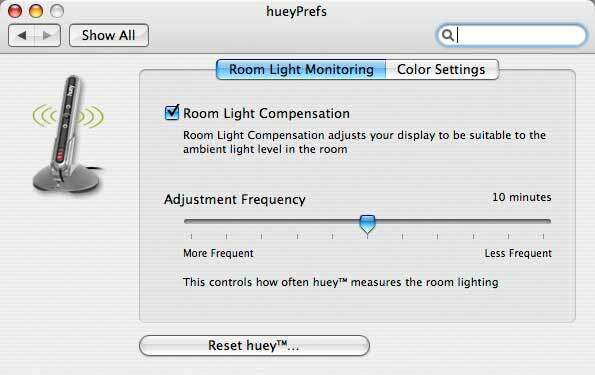 Do you want the software to update your calibration if the room lighting changes? So, there you have it … your display is calibrated. You can alter settings in a control panel afterwards, without needing to run the application again. 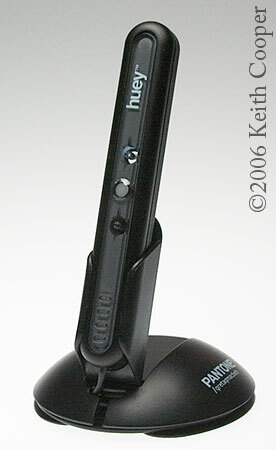 It’s very easy to use, once I decided that I really wasn’t going to stick things to my big LCD screen. 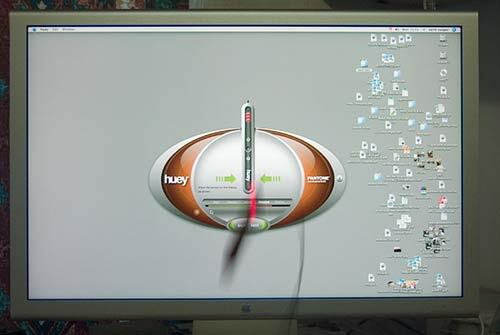 The software explains very simply what to do, and you end up with a calibrated monitor. Well, yes you do, but calibrated to what? 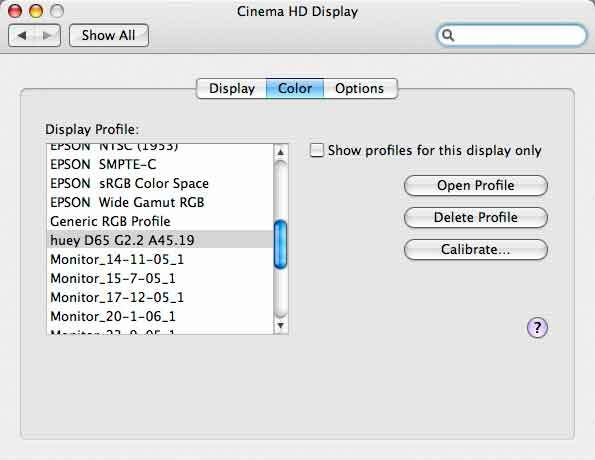 The software installs (on the Mac) a preference panel that allows you to alter settings after you have carried out the calibration. It’s a good idea to have a reminder as to when to calibrate — but how long will it be if I tick that box? 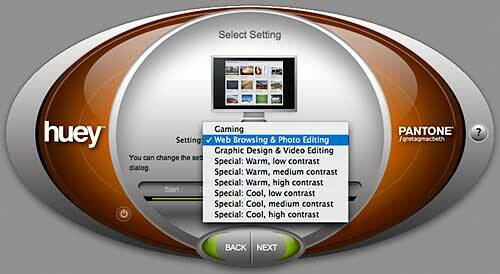 I could have had all other kinds of settings, but what is ‘Special: Warm, medium contrast’ ?? Windows users — stick with me, it looks different on your systems, but the point I’m making is the same. D65 and G2.2 refer (I assume) to the calibration settings. D65 is not quite the same as 6500K but it’s near enough at this level. …but what about the A45.19? I suspect this refers to the room lighting conditions, since it changed when I opened the curtains and got the software to re-check. 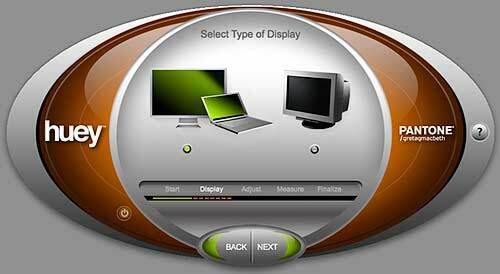 If automated this ‘feature’ can modify your display profile at set intervals. This can range from 10 seconds to 4 hours. I went through the settings and found this (possible) correlation between them and profile names. Would it really have been that difficult to include this table for reference somewhere? A designer who hasn’t calibrated their monitor before decides to set it up with the Huey and is faced with the choice of settings. Now let’s assume that their monitor is a CRT with a native colour temperature of ~9000K (rather blue). They look at the options and decide that they all look a bit yellowish (newly calibrated monitors often look ‘wrong’), but no, ‘Cool: high contrast’ gives their graphics just the punch they were looking for. – prints look all wrong and the blame game starts. I applaud the idea of getting more people to calibrate their monitors, and if this product was just aimed at consumers I’d welcome the simplification of the process and the decision to unburden them of the requirement to learn the basics of colour management (not that I think the principles are beyond most people). BUT… this product is going to be purchased by many small companies looking to get their feet wet in colour management. You could say that they should go for a more advanced option such as the Spyder or Eye One Display that I’ve looked at elsewhere (reviews). However I know small companies – money matters, so the Huey will sell. OK, I’ll accept that having lots more people with calibrated monitors is a good thing, it’s just I’d like to have seen a bit more guidance in the application help, to explain why some choices were better than others. There is a PDF quick start guide on the software CD, unfortunately it’s just a PDF of the printed guide you get with the product. Because of the small sensor size I’d also suggest that you carry out your calibration in dimly lit conditions. It does not take much light reflected off the screen into the sensor to affect the measurements. No, I don’t think I’d really want my monitor settings changing with the weather — I’d leave the ‘Automunge’ feature switched off. The interface of the software is quite well designed, but I found it irritating that it added an item in my menu bar that I couldn’t hide from within the Huey preferences. Very easy to use and set up. Profiles produced a noticeable improvement in displays. I’d suggest using gravity rather than the rubber suckers, when calibrating LCDs. I just don’t like the idea of trying to stick things to a LCD screen. At the price, it’s going to be popular, but I do take serious issue with the degree that the interface/help has been dumbed down, to the point of not including useful information that might help people make better and more consistent use of the product. If you are considering the Huey, then you might also like to look over my reviews of the Pantone Eye One Display LT and Pantone Eye One Display 2, where there are charts comparing the 3 devices.